Often, I get so caught up in trying one of the 500 recipes I’ve bookmarked recently that I forget to exercise my own culinary abilities. I’m no gourmet chef, but part of the reason I like cooking so much is that I’m mildly good at it. I can come up with my own dishes using just what I have on hand and the ideas in my mind. Really, I can! I actually do this most days for lunch, but dinners have become very recipe-focused. Even when I have an idea what to make, I find myself searching for a recipe that matches my idea, so I can follow it. The other night, I had a little chat with myself, and told myself to gain some confidence. Just make dinner. 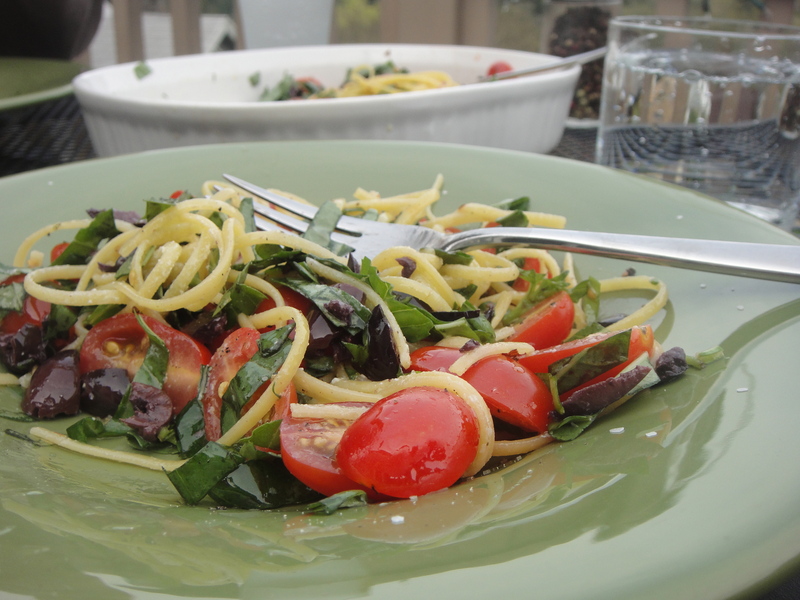 I had fresh basil crying to be used (from making this salad the other night) and some lovely organic grape tomatoes that had miraculously been on super sale at Safeway. The dish I made wasn’t revolutionary. In fact, it was pretty predictable. It won’t win any accolades. But it was healthy, delicious, and quick; the perfect meal for a sunny weekday night. Our first meal al fresco in fact, since spring has finally made an appearance in Seattle! I of course recommend you try making this pasta for dinner some night. But more than that, I encourage you too to remind yourself to throw recipes out the window once in awhile and go at it alone. 1. Boil water for the pasta. While waiting, slice the tomatoes. 2. Cook the pasta in salted water until al dente. 3. Place the goat cheese in the bottom of a serving dish. Drain the pasta, and pour on top of the cheese. Add olive oil and mix until the oil and cheese coat the pasta. 4. Mix in tomatoes and olives. Season to taste with salt, pepper, and red pepper. 5. Gently incorporate basil so it doesn’t discolor.